SCRA has made improvements to a number of Hearing rooms to try and increase the participation of children and young people. 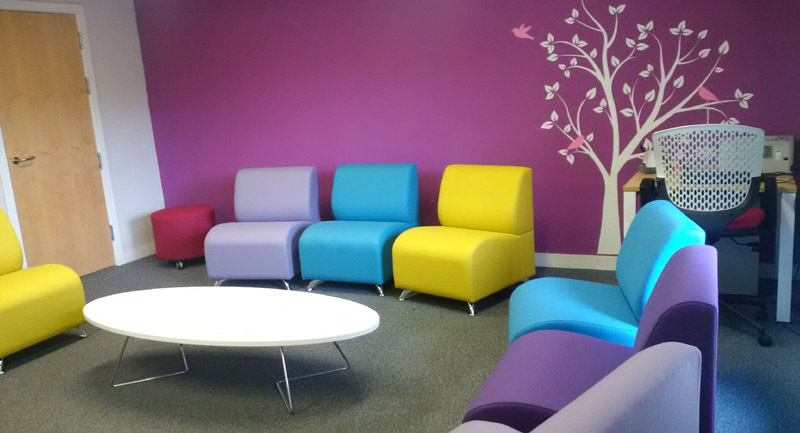 Nine of SCRA’s Hearing rooms across Scotland have had a revamp recently and Children’s Hearings are now being held in the new look rooms. 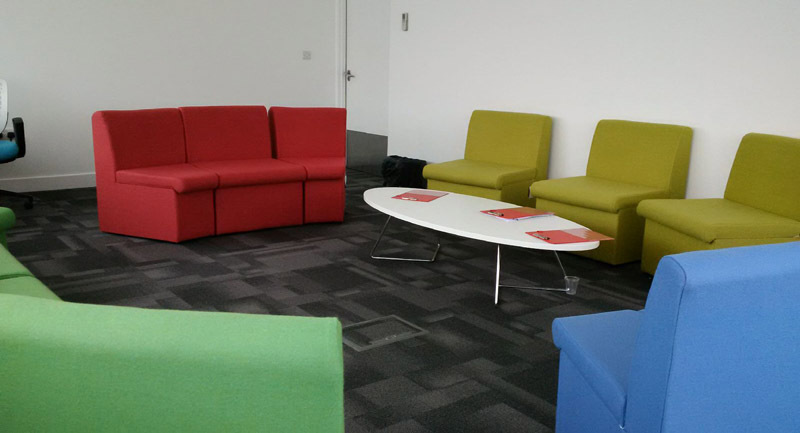 The improvements follow on from the pilot model Hearing room in Glasgow which was launched in the summer of 2015. The room was designed with input from young people with experience of the Hearings System and a formal research project was carried out to evaluate the room. The feedback was extremely positive and you can read the report here. It was then agreed that future improvements to Hearing rooms should either follow a similar look to the model Hearing room or that local young people are involved with the re-design. Kilmarnock has adopted the model Hearing room approach with bright coloured soft furnishings and a low flower shaped table. 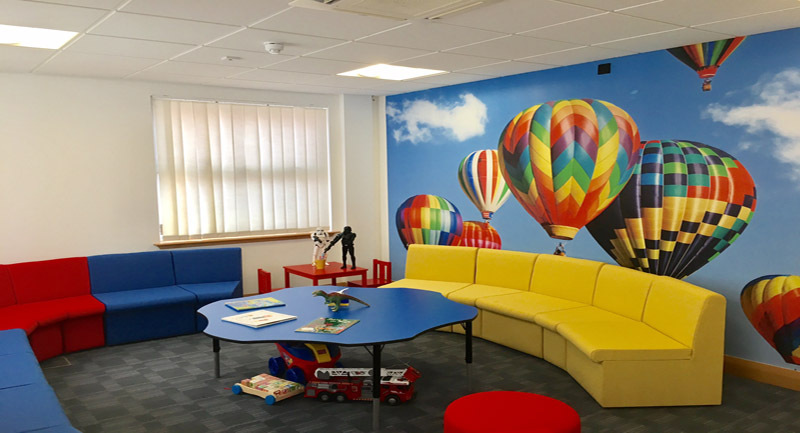 The new look room also includes a feature wall with brightly coloured images of hot air balloons. Stirling has adopted its own unique design after consultation with Hearings-experienced children and young people. This includes softer furnishings in purple and green colours and a low table. They have also used colourful notice boards so that they can display children’s artwork within the Hearing room. Livingston has soft furnishings in slightly less-bright shades of the primary colours used in Glasgow and a coffee table. 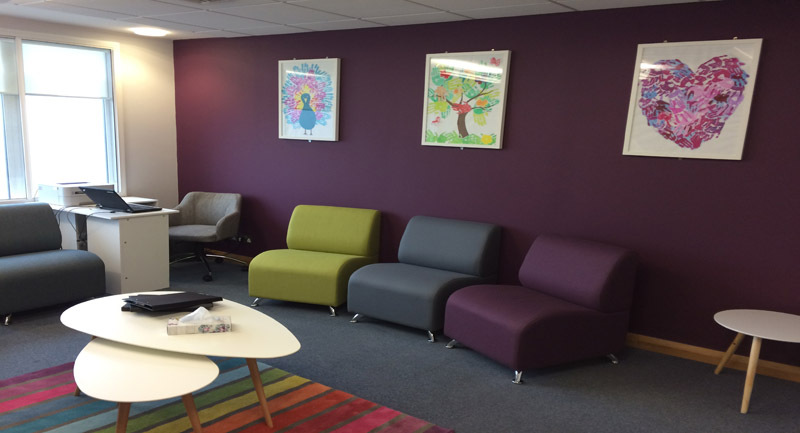 They have also brightened up the room and waiting rooms with colourful wall art. Aberdeen has adopted its own unique design after consultation with local children and young people. They have gone for purples and greens for the soft furnishings after young people chose purple paint for the wall. They have a brightly coloured rug and children’s art displayed on a purple wall. Hamilton has adopted the model Hearing room approach and they have also utilised elements of the décor used in the Glasgow model Hearing room to compliment the waiting and Hearing room areas. A local secondary school has agreed to provide artwork for the walls. 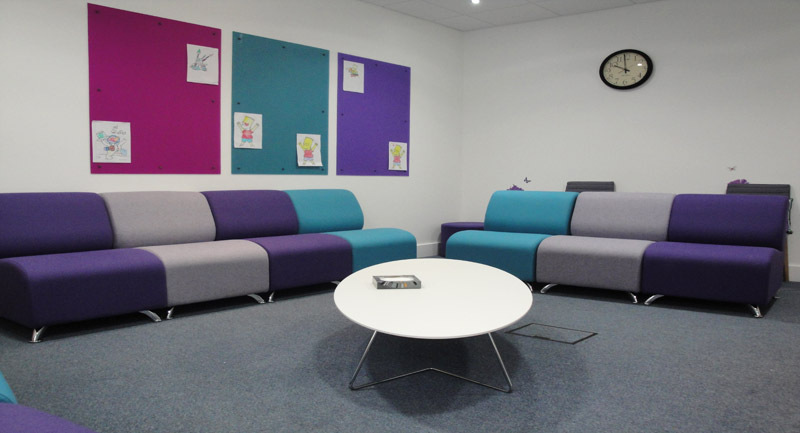 Paisley has been working with their local Champions Board and have chosen soft furnishings to complement their existing colour scheme, with purple, blue and bright yellow chairs and a low coffee table. The team have provided small laptop tables for Panel Members to use. Greenock will be adopting a unique approach, after they surveyed young people attending Hearings to establish their preferences. Although still in the early stages, we hope to feature the view of the outdoor garden from the Hearing room, utilising colourful blinds which can be used flexibly to ‘bring the outside in’, and to provide confidentiality. We are also looking at ways of improving the large waiting area. Glasgow are benefitting from two new Hearing rooms on the ground floor of Bell Street. One of these has been completed in the model Hearing room style, with bright primary coloured soft furnishings and a low table, and the other will be a calming ocean-themed Hearing room with a large canvas of a Scottish seascape covering a feature wall. There are no windows in the room so the canvas will introduce light and a sense of the outdoors. 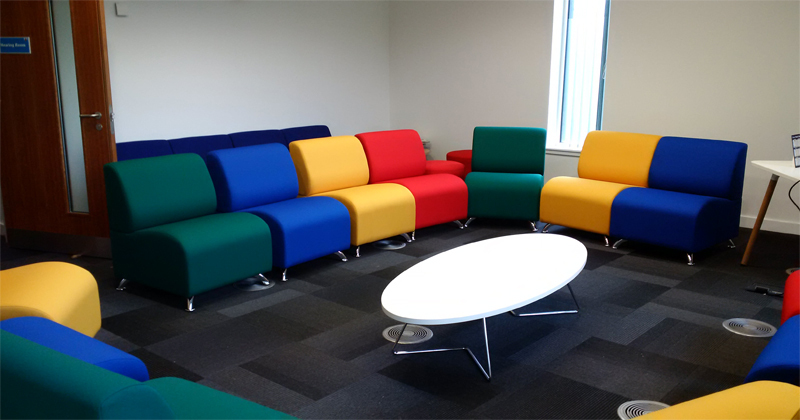 A unique ‘U’ shaped couch will take up a large part of the room to give a sense of openness and participation. Hearings-experienced young people will help them to finalise the design.